The Thomson Meter Co. seems to have been located in this building from the late 1890's until 1909 when they relocated their Brooklyn factory to 100 Bridge St. 100-110 Bridge St. is a landmarked building with beautiful terra cotta at the top of the facade. The New York City Landmarks Preservation Commission report, LP-2139 (2004) for 100-110 Bridge St. can be read at http://www.neighborhoodpreservationcenter.org. Guide to New York City Landmarks, 4th edition (2009), says, "Thompson Meter Company Building, 100-110 Bridge Street (Louis E. Jallade, 1908-09), designated 2004. This building is an early example of reinforced concrete structure on which the concrete surface is both exposed and adorned. Jallade, a Canadian-born architect-engineer who studied at the École des Beaux Arts, used tapestry brickwork and colorful glazed terra cotta to embellish the four-story arcades. Sold in 1927, the building was used for nearly four decades to manufacture Eskimo Pies, the first American chocolate-covered ice cream bar." The founder of Thomson Water Meters was John Thomson (1853-1926), born in Scotland and raised in upstate New York. His obituary in the New York Times, 2 June 1926, pg. 25, read, "John Thomson, engineer, inventor, and President of the Thomson National Press Company of Long Island City, died on Monday at his home, 388 Clinton Avenue, Brooklyn, after an illness of two weeks, aged 72. Mr. Thomson was born in Fochabers, Scotland, the eldest son of Alexander Thomson and Elizabeth Hay. He came to America at an early age and was educated in the public schools of this State. For more than thirty-five years Mr. Thomson was engaged in mechanical, electrical and civil engineering, especially in the design and manufacture of printing presses and water meters. He obtained more than 200 patents in this country and abroad. In 1887 Mr. Thomson married Miss Alice Elizabeth McKee of Canandaigua, N. Y., who survives him, with two sons, Ralph and John, and a daughter, Edith, now Mrs. Spencer M. Maben. Funeral services will be held at 86 Lefferts Place, Brooklyn, at 10:30 A. M. tomorrow. Interment will be in Greenwood Cemetery." Concerning Thomson's water meters the American History website at the Smithsonian Institution, offers, "John Thomson, a prolific Scottish-born inventor raised in the United States, was one of the first Americans to realize the advantages of a disc water meter. In the mid-1880s, Thomson met Frank Lambert, a French machinist in Brooklyn who had designed a typewriter with the letters arranged on a nutating disc. Working together, the two men designed a water meter featuring a nutating disk. The Water-Waste Prevention Company was then formed, and reorganized as the Thomson Meter Company in 1891. With Lambert as its president, Thomson Meter introduced the Lambert in 1898, claiming that the new model 'embodied all the improvements which the tests of time and long service have proved to be requisite in a perfect meter.' Despite this early claim, Lambert would go on to suggest dozens of improvements, many of them designed to make the meter frost proof, over the course of the next several decades. ... The Neptune Meter Company acquired Thomson Meter in 1925 and was still offering Lambert meters in the late 1930s." A wikipedia article on François "Frank" Lambert (1851-1937), Thomson's partner, can be found at https://en.wikipedia.org/. A more complete account of Lambert's life and his association with John Thomson is found at http://www.nipperhead.com/. This includes, "While Lambert was living in Ansonia, he met a man who would have a profound influence on his life - John Thomson. In 1883-1884, Lambert assigned one half of his first typewriter patent to Thomson (who had originally been a clock inventor) and more prophetically, shared a patent with him on water meters in 1887. 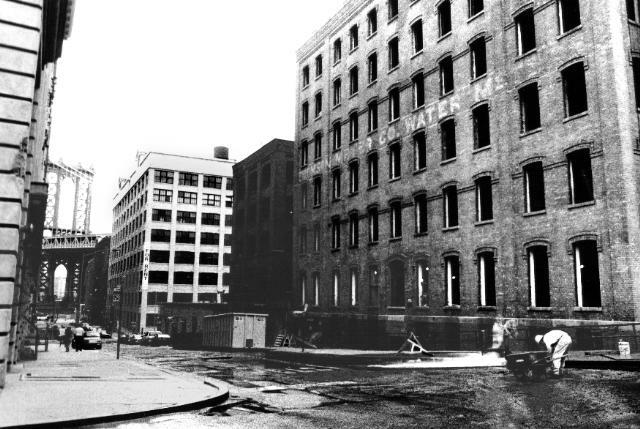 Lambert continued to improve fluid-measuring devices and together they formed the Thomson Water Meter Co., whose facilities were located at 100-110 Bridge Street in Brooklyn (now torn down). When Thomson was ailing in May 1925, the company was sold outright to the Neptune Water Meter Co. and Lambert received $800,000 in cash." (It is, of course, incorrect to say that 100-110 Bridge St. was torn down. It was still very much a presence at this location in 2017.) The Lambert typewriter is shown at https://www.antikeychop.com. The Thomson Water Meter is described and illustrated in some detail in the publication, Reports of the United States Commissioners to the Universal Exposition of 1889 at Paris (1891). available on google books. The sign on York St. was possibly 100 years old when this photograph was taken. The building was renovated in 1999, and the sign re-painted! Dommage. Click here for image of Thomson give-away from 1896. This advertisement for Thomson ran in the magazine, The American City, vol. 21, Dec. 1919. Their address at the time was 100-110 Bridge St.
An example of one of John Thomson's patents can be found at http://www.google.com.pg/patents/US476095. This "Apparatus for Calibrating Water-Meters" was granted in 1892 and assigned to the Thomson Meter Company.